It was a bit of a slog, taking 20 months elapsed time in all, and, to be brutally honest for all you budding authors out there, the money wasn't worth it. Don't get me wrong: the fame is great, it's just that the fortune is lacking. Now, I dare say that some authors make money at writing technical or computer books, selling tens of thousands of copies. But consider this: the Delphi market for books is bad, no two ways about it, and to pile even more ignominy onto it, the market for computer technical books is pretty grim too. In fact, the Delphi book market is so small and fragmented, Wordware (the original publishers of my book) pulled out completely. They are not going to print any more Delphi books, and, indeed, the story I have is that they are not going to reprint any either. Since the book was then officially out of print, under the terms of my contract, the copyright then reverted to me, but at a point in my life when I didn’t have enough time or even passion to organize a reprint. Meanwhile, the secondhand market in my book started to get crazier and crazier. The people who’d bought it wanted to keep onto it thereby causing a shortage. The price on Amazon rose and rose, breaking the $100 mark, the $200 mark, and finally the $1000 mark. A grand for my book? Although I’m mildly biased and believe the book to be the best Delphi book ever written and possibly the third best algorithms book (gotta leave Knuth and Sedgewick at the top, don’tcha know), even I don’t believe it’s worth a grand. And then Borland released their free Turbo editions of Delphi. Suddenly, it looks as if the Delphi market has the opportunity to grow again. My book was relevant to that market, especially in a cheaper edition for beginner or student programmers who would be downloading Turbo Delphi for Windows, and so I decided that I should finally do something about it. I cleaned up the Word files, typeset them, and then produced a PDF for Lulu to print as an on-demand book. The reviews, uh, poured in to Bucknall Central at one stage. Actually there have been three very favorable ones published, as well as those on Amazon.com. The first is by Bob Swart, from his website and the UK-BUG's newsletter, the second by Tom Lisjac, as published in Delphi Informant. The third I discovered only very recently (Feb 2004) on about.com. The fourth is a review on Amazon.com that needed a reply. Alas alack, because I write for The Delphi Magazine means that they can't review it because of a possible conflict of interest. Oh well. Any technical book is bound to have errors. The issue with errors is in not being upfront about them and providing fixes or workarounds. Without further ado, here are the errata for the first edition of my book. 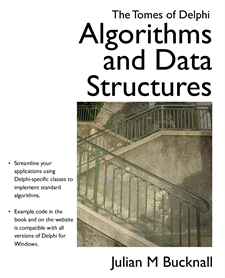 ToDADS errata: Chapter 1: What is an algorithm?